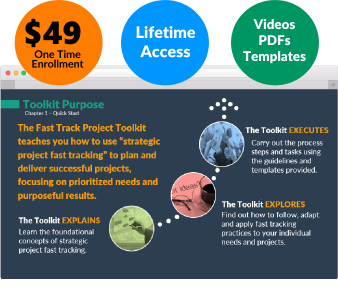 Just $49 gives you lifetime access to the Fast Track Project Toolkit, teaching you how to use strategic project fast tracking to manage successful projects. And you can start for free! ARE YOU READY TO BE A PROJECT MANAGEMENT SUPER-HERO? When you learn the 'fast tracking' process, you will learn both the strategic concepts and the executable steps. This ensures that you understand the formative process principles (why it works the way it does), as well as the actual steps required to make process work happen. 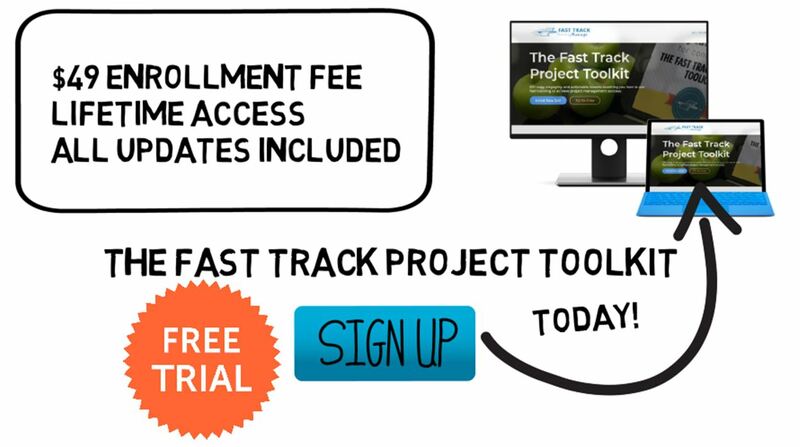 If you want a first hand look before you commit to the full Toolkit, you can get started by enrolling in our free Fast Track Project Starter Course. We begin by setting the stage for fast track project learning -- with a review of project management basics and how strategic project fast tracking fits in. We continue with a presentation of the key fast tracking concepts and process structure, taking you from project initiation, through planning and oversight, to post project review. Then we teach you how to get your projects defined and aligned to "prioritize and optimize", presenting (30) key definition and alignment guidelines. And then we move on to governance planning, where we teach you how to size management practices to balance best practices, current project needs and available resources. It's the time to deliver. Learn how to plan and produce the Fast Track Charter, the primary deliverable you create to guide your projects through the fast tracking process. After you've learned all the concepts and steps, you can download the templates, including the Fast Track Charter Template, Lessons Learned Report and more. Big Picture Video Part 1 - What is Fast Track Management? Note: Toolkit components can be added and updated at any time. When you sign in, you will always have access to the latest lessons, templates and materials available. Once you register, you will have access to all future additions and updates at no additional cost. SUBSCRIBE TO THE TOOLKIT FOR FULL, INSTANT ACCESS! Or, try the free Fast Track Project Starter Course.